Let’s start with these wise words by David Cameron: ‘Christmas gives us the opportunity to pause and reflect on the important things around us – a time when we can look back on the year that has passed and prepare for the year ahead.’ Undeniably, Christmas is the time when you can see the miraculous decoration, Christmas icons and Christmas templates all around! It’s the time of the family evenings, amazing trips, and cozy gatherings. All in all, it is a nice moment to meet the old friends and share the recent news having a cup of coffee. To say more, it is the time of presents! Everyone loves Christmas time thanks to its cozy atmosphere. Still, it is an ideal moment to sum everything up and change your life for the better. 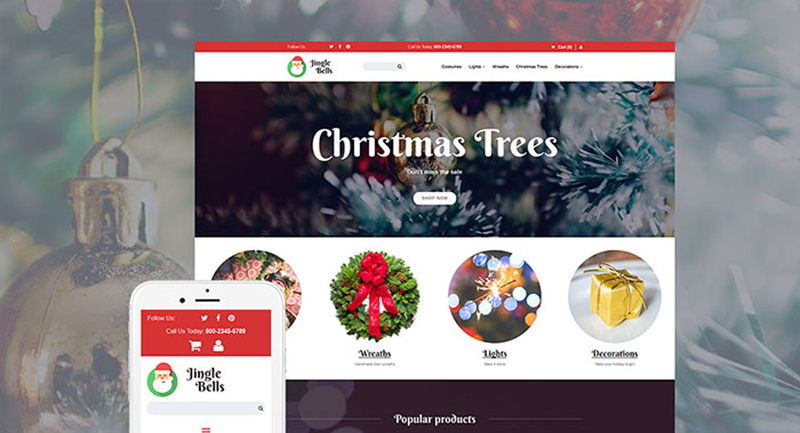 Seeing that, we decided to share with you this brand-new list of top 15 Christmas website templates. In a word, the mentioned products will be a ready-made solution for an online shop, related to holidays and gifts. 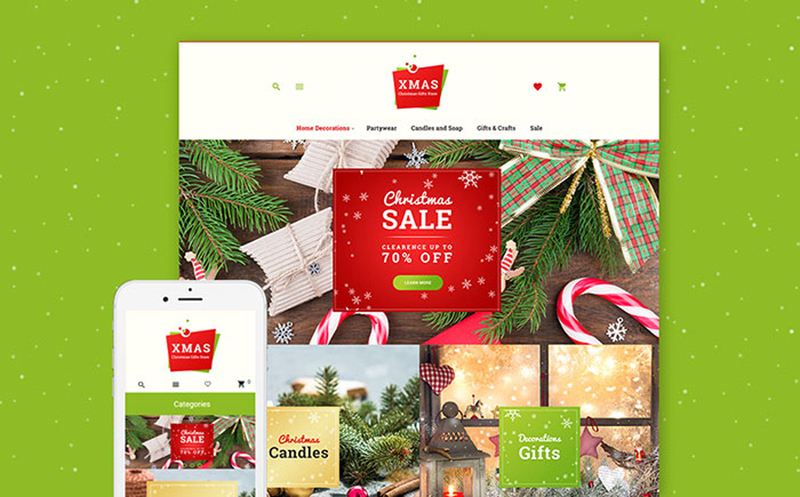 Therefore, the groundbreaking and ready-to-use templates below will bring a Christmas design inspiration to your eCommerce project. Let’s charm your buyers! How Will These Christmas Templates Develop Your Business? also many design elements that will quickly enrich your wonderful business project. To illustrate, below are the features that you can use to present your items in the most beneficial way. By tradition, there is a modern blog to share the news. Furthermore, a blog log roll will be shown on your homepage to attract the visitors. Also, you can use Product Grid and Product Carousels to present the selling items in all their glory. Another cool feature is Product Slider that will help you to introduce the products to the audience. These new-gen Christmas templates contain the unusual effects. As s result, you can enrich your shop’s design with the help of Parallax scrolling and awesome animation. Unquestionably, such trendy things will share your Christmas design inspiration with the visitors. The next thing you should think about is Product Badges. They are also in the pack of these ace Christmas templates. To make a long story short, this elegant option offers you to add different badges to your products. Thus, you will grab the attention of your shoppers. What Else Can You Do with These Fantastic Christmas Templates? fully responsive design. They feature SEO integration, so the popular search engines will quickly index your webshop. Unquestionably, it will increase social traffic. inform the visitors about sales or special offers. As you can see, the products below have everything to grab your clients’ attention. Moreover, they will enrich your online shop with an unforgettable Christmas design inspiration! Given these points, are you ready to impress customers with a sparkling appearance of your web store? Would you like your items to be available in several countries? Are you ready to get your bodacious web store done? In this case, let’s go to this new selection of best 15 Christmas templates! 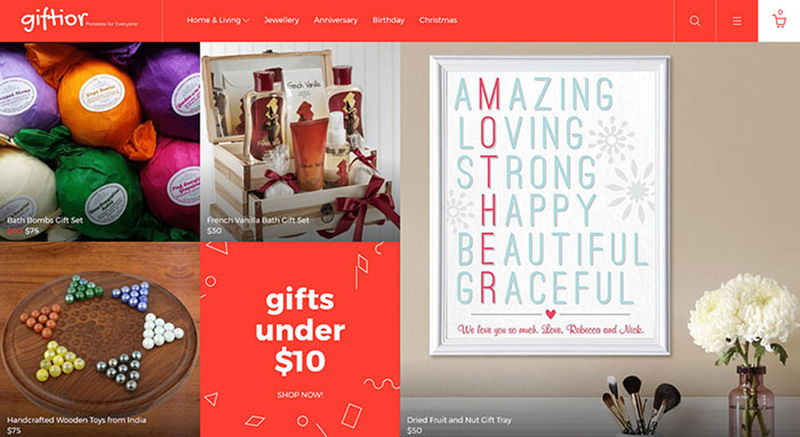 Initially, this 100 % responsive Magento template allows you to launch a magnificent gift online shop. The visitors will be able to enter it using any device with any screen size. Thanks, this must-have option, people will always be able to visit your website and see the items without interrupting the shopping process, what will gain social traffic. 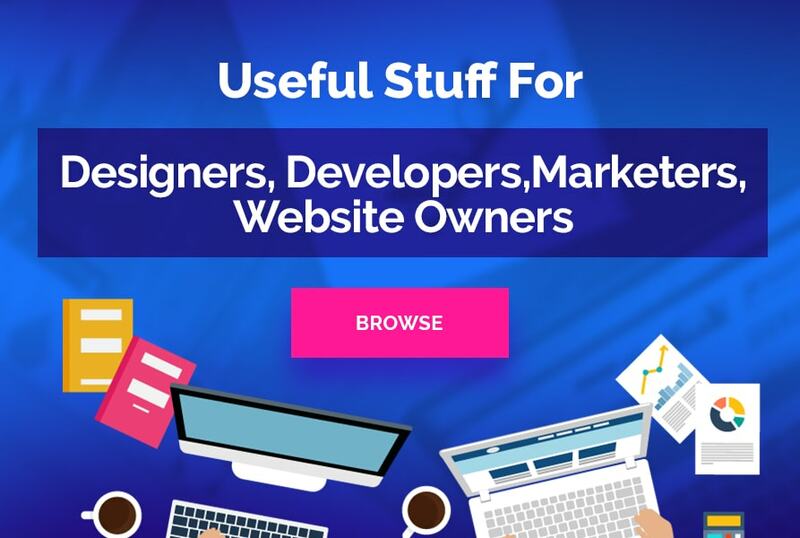 In addition, Giftior includes a stylish blog that you can display on the home page to attract the guests on your cute online project to its subject and present your webshop in little things. For these simple reasons, the blogroll of your company has a neat design. It contains comments as well, so everyone will be able to see the most liked or the most discussed posts. Would you like to find a feature-rich eCommerce solution for your groundbreaking web store? Would you like it to allow to accept payments online via PayPal, 2Checkout, and other popular systems? In this case, we recommend you to take a closer look at Jingle Bells. This product stands out among all the recent Christmas templates thanks to cool features like White Label for Developers. To make a long story short, with its help, you will easily save money while building your own brand. What is more, Jingle Bells features the charming Parallax and Animation effects. They will professionally guide people through your catalog and show them your Christmas design inspiration without a hitch. At the outset, Handmade and Gifts provides its owner with a sweet Christmas design inspiration. It contains a lot of well-styled elements, beautiful buttons, unique typography and much more. Naturally, the hi-res Joomla theme includes Social Login. It allows your buyers to log in with the help of their Facebook or Google accounts. 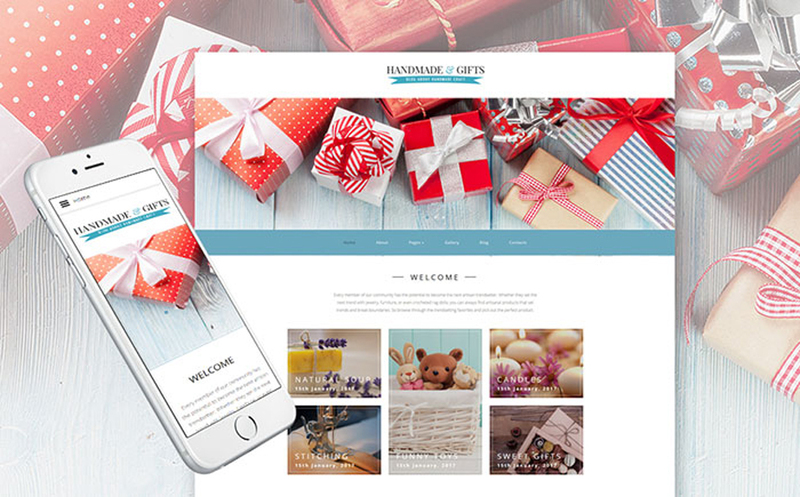 Furthermore, Handmade and Gifts allows one to keep their website in line with your corporate identity. There is a modern Theme Color Switcher that you can use to change the shop’s interface just in a click! To end with, keep in mind that the template provides its owner with many additional pages. They contain such basic things as gallery, history, forum, blog, portfolio, pricing, team information, etc. Without a doubt, everyone hates this browser-testing process but you can finally forget about it! 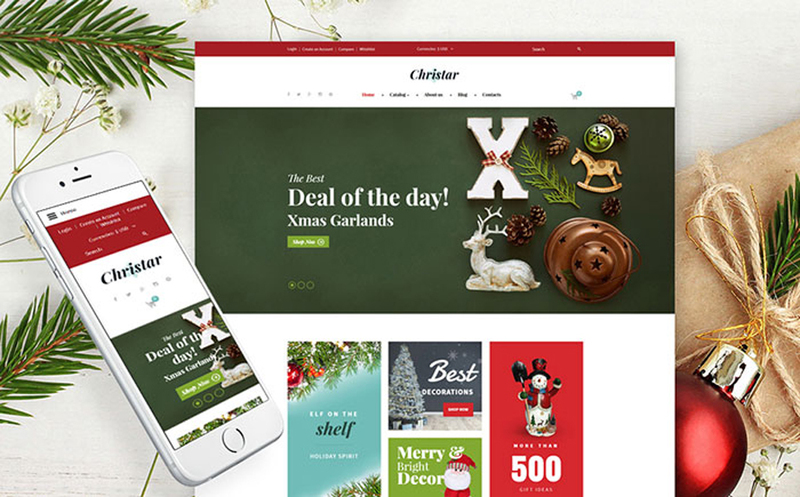 Christar features Cross-browser Compatibility, so your online shop will provide a gorgeous functionality in any browser. This groundbreaking Christmas template has a light and minimalist Newsletter Subscription window. It appears when a user enters your site and allows people to get all the news and updates via email. Furthermore, you can put the strikingly-colored banners with the discounts, sales, and special offers information on top of your pages. So, the shoppers will always keep the track of the upcoming events. Finally, this eye-pleasing and voguish holiday and gifts VirtueMart theme contains Featured Products function. It means that you can showcase the most popular items with their prices, categories or descriptions on the main page. 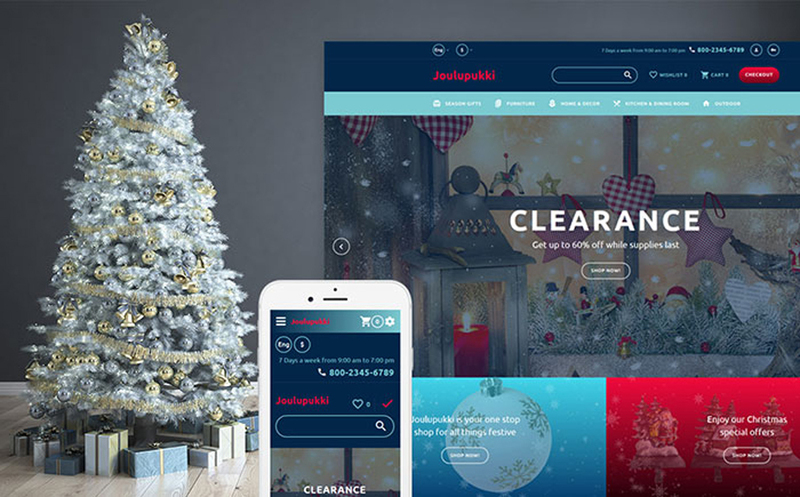 To begin with, Parallax scrolling is the first thing you should know about Joulupukki. This well-known web trend will help you to create a unique promotion for your items with the help of a charming illusion of depth and motion in 2D environments. Therefore, don’t hesitate to run a live demo to see how the effect works in action. To say more, this crisp Christmas template is multilingual. It will make the online shop available in different languages, which will surely enlarge your auditory. Moreover, it is also multi-currency. So, you will sell the items being able to accept multiple currencies and manage an international website. 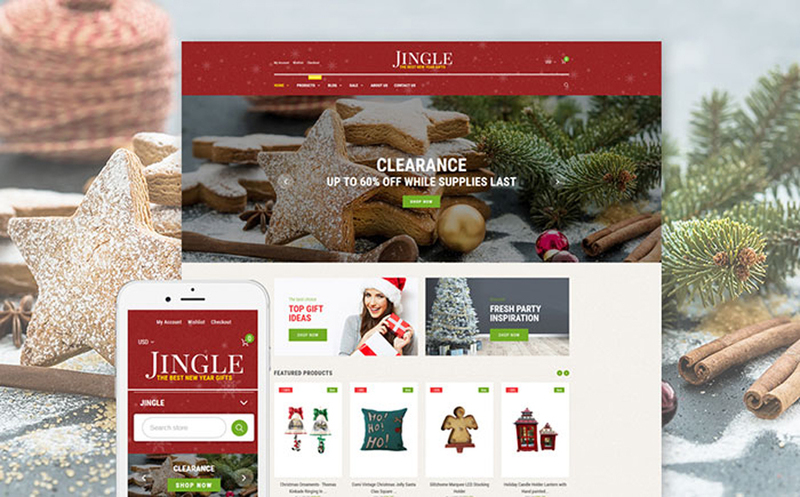 Before all else, Jingle contains a professionally styled MegaMenu that brings a qualitative and comfortable navigation to your web store. Therefore, the feature helps its owner to organize the categories and subcategories effortlessly. What is more, Jingle boots your user and SEO engagements and includes the amazing Sorting Options. It allows the buyers to filter your project’s content by best-selling, display it in an alphabetical order, and much more. Another benefit of Jingle is that all the changes are applied mechanically. So, the guests of your brilliant online project will not need to reload the page. At the outset, Xmas is a high-quality and attention-grabbing Christmas template. It lets its owner presenting the most important information (sales, bonuses, new items, etc.) with the help of a built-in Slider. For these simple reasons, the feature has many customization options to grab your visitors’ attention. And it doesn’t require you to have some coding skills. Another eye-catching must-have for every worthy online shop is Special Price Countdown feature. It lets you set up a timer for each and every item you want to highlight. To make a long story short, this cool option will show the shoppers how much time they have until your special offer ends. First of all, choosing this eye-pleasing Christmas template provides your images with the stylish clickable buttons for the Wishlist and Compare options. Unquestionable, these are the features that are necessary for every qualitative web store because with the help of Compare functions your guests will be able to compare several products by their prices, features, etc. In addition, the ready-made OpenCart template below includes Ajax Cart, which allows adding the items to the cart without reloading the page which will easily further the shopping process. What is more, there is also Ajax Search that you can use to get the live results when you type, so here is another option that will make visiting your bodacious online shop even more comfortable! As you can see from this magical Christmas template’s demo, Deluxe Card includes Product Badges, so you are able to add the badges to the products that will indicate their values and statuses. Although these stylish elements are pretty small, they will quickly attract people to the items you sell, so you can easily tag the new products, the products that are on sale, the ones with the discounts and much more. The design of this content-driven Magento theme allows you to put the most important information (such as contacts, hours, shipping, etc.) on the bottom of your page. Moreover, you can also place here such things as ‘Subscribe’ button and many tiny icons that will redirect to your social media accounts, so the shoppers will be able to follow you on Twitter, Instagram, Facebook, YouTube, and Google+. 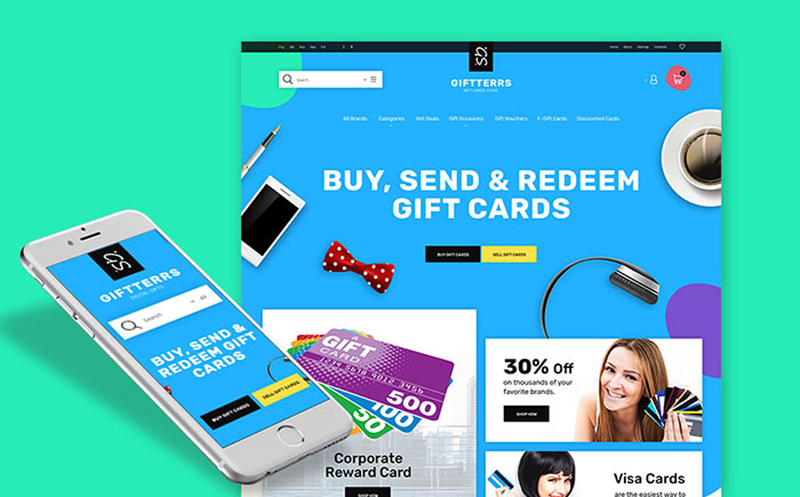 Shortly, Giftterrs is a strikingly-colored and full-fledged Prestashop theme, which lets its owner build a menu of any complicity (with multiple tabs, banners, categories, and subcategories) using MegaMenu option. 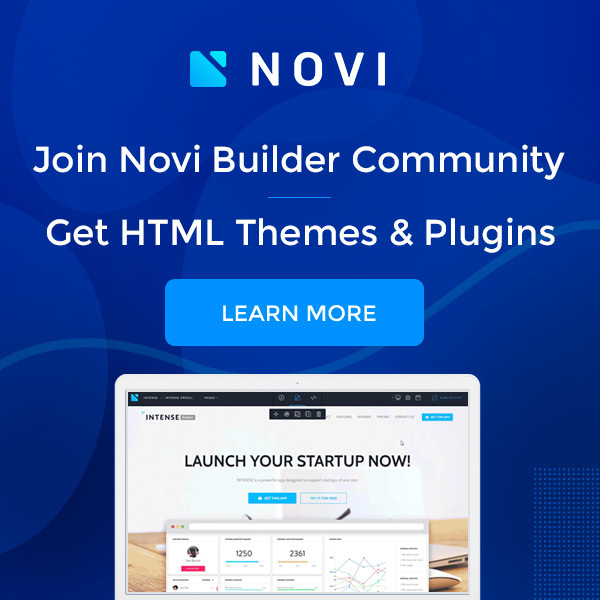 What is more, Giftterrs contains 4 inspiring color schemes to choose from, a ready-to-use blog layout page, and TM Mega Layout Builder, which allows one to create a home page on their taste just in a few clicks. Furthermore, a voguish TM Collections is a real zest of this template, as the module allows your visitors to create different collections using your items and share them via social media accounts. To sum everything up, each and every of Giftterrs’ elements is easy-to-use, so you will have no issues with your unbelievable web shop, even if you have no eCommerce experience. Basically, being in the top search result is the needed thing for a prospective online project, especially when it is about eCommerce. 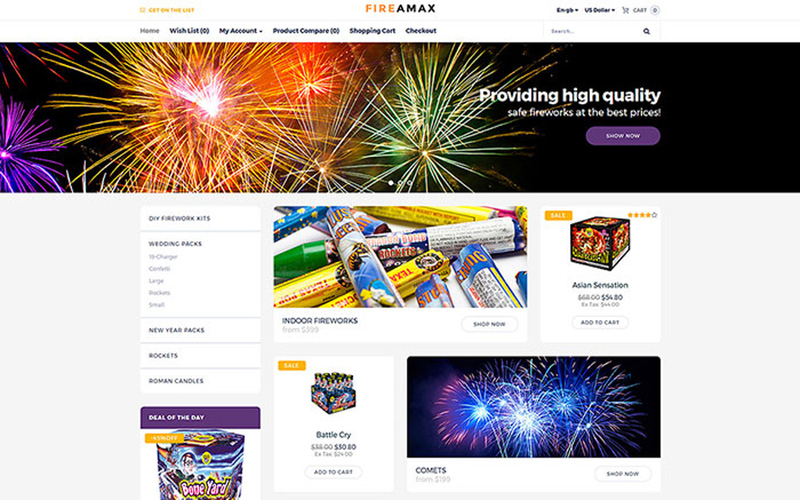 That is why Fireamax is a responsive Christmas template, which has a valid and well-commented code that follows the best SEO-practice, so you will get higher rankings from Google, Yahoo, Bing, etc. thanks to a super-high page speed and a professional search engines integration. Talking about comfort, you can easily place many must-have, attractive and necessary sections on the top of your main page, so there are call-to-action buttons, noticeable counters, ‘Get on List’ buttons for people to subscribe, cart, live search and much more. Needless to say, there is also an opportunity for the buyers to change the language or the currency because this stunning OpenCart template is an RTL ready one. Naturally, Alleando was thoroughly designed in order to showcase your items in the most stunning way, so it features TM Product Videos for these needs. In addition, there is an outstanding TM Media Parallax, so you can use both of these features to create a magical introduction for each of your web store’s products. There is a place for your shipping details where you can tell the shoppers about the journey of an ordered product, so they will feel safe with this information. Finally, don’t hesitate to filter your products (e.g. new arrivals, sale, and best-sellers) and introduce them using Product Carousels, as there is a handy Quick View button, which automatically changes a preview image as soon as a user hovers over the icon. Honestly speaking, there is nothing good in the limits in terms of a device or a location, so you have to make sure that the potential shoppers will be able to enter your webshop whenever they are. 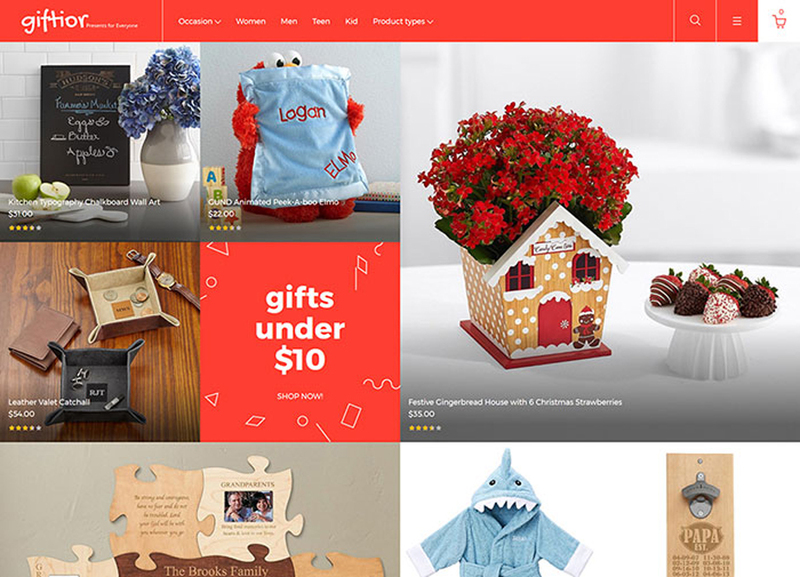 Therefore, we suggest you hit the demo of Gifts, as this minimalist OpenCart theme is a responsive one, which means that your future site will look marvelous no matter what devices the buyers are viewing it on. What is more, Gifts contains Social Sharing, which allows you to promote your business via social media that will surely enlarge website’s audience. Also, there are such helpful things like ‘Order History’, ‘Sitemap’, Ajax Search, smart Sorting Options and much more to help your visitors with a pleasant shopping. Basically, Lantiana requires no technical know-how and provides you with the detailed step-by-step guides that will improve the work with this tip-top Magento template. 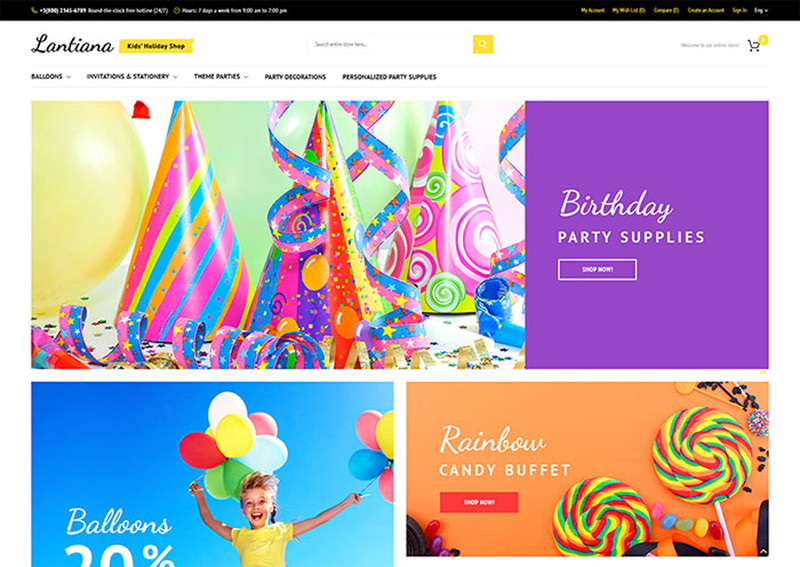 Moreover, this brand-new product offers you to use the recent brand filters, so the visitors of your candy online project will be able to shop by brands that will further the process. Needless to say, Lantiana proposes one to use banners, tag their items with badges, use a smart Ajax Catalog filter, etc. to draw people’s attention to the content of your webshop. In addition, the pack of this inimitable template contains Catalog Images Grid, which you can use in order to showcase the selling items in a stylish way. Unquestionably, you will be surprised when you will see how fast this cozy theme is. So, you will get the impressing results from the search engines. 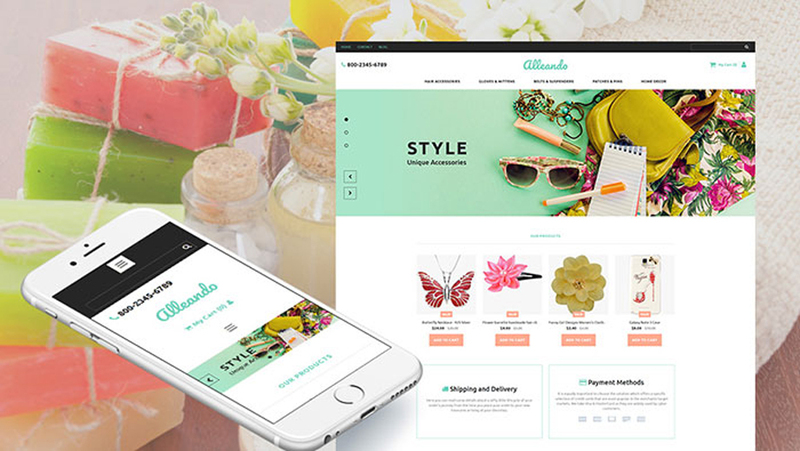 What is more, the admin panel of Alleando provides its owner with a super speed as well, so working with the product one will both save their time and drill the website building skills, as the theme is also ready-to-use. To say more, the eCommerce MotoCMS theme below includes a supreme Color Picker, which allows you to design the online shop with a professional color palette with the help of one click! Additionally, Alleando helps you to represent the products in a creative way using Slides and Audio Player widgets that will showcase the items with the help of the fully customizable carousels. 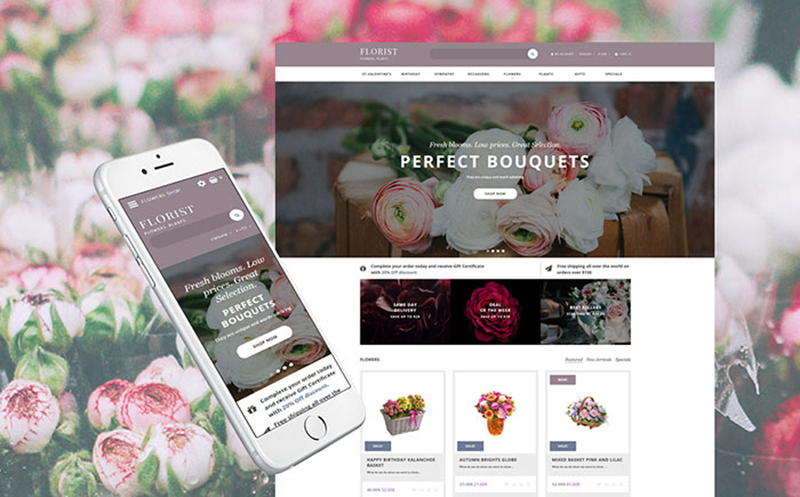 As you can see, Florist has a soft and extremely eye-pleasing design, which will charm any shopper, so now you can set up an astonishing and strong online flower shop without coding. In a word, the professional designers based Florist on the powerful framework and made it fully responsive to ensure your beautiful business runs smoothly, so leave all the sad thoughts behind you back! 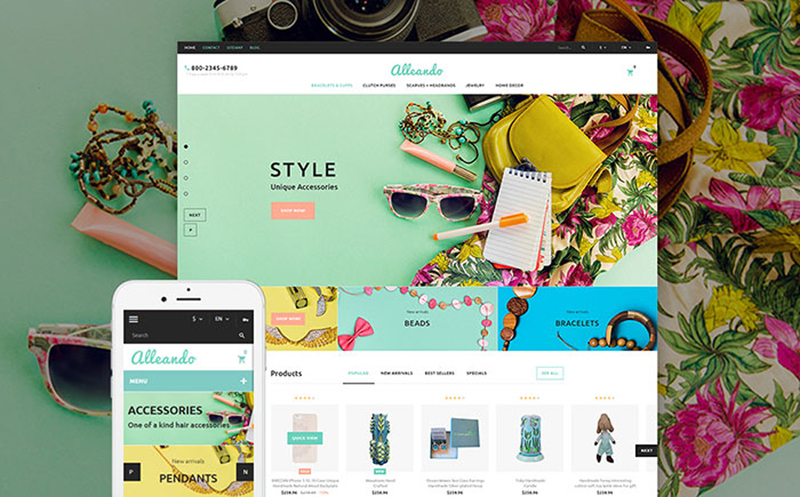 This aesthetic OpenCart theme has an easy-to-manage blog, which you can tweak up to your taste and allows you to present its latest updates on the homepage. Thus, people will see there the voguish pictures, the date and the beginning of a post, so don’t miss your chance to enchant the guests of your prepossessing online shop! Well, for today these were all the outstanding Christmas templates. 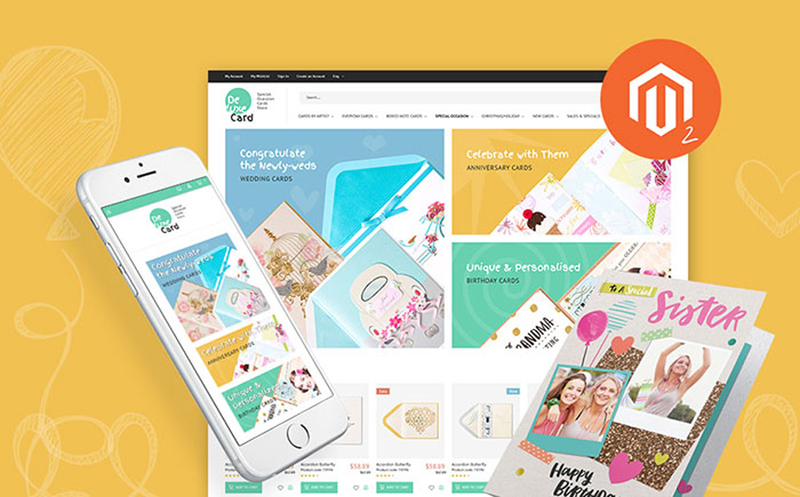 Without a doubt, each of the showcased themes will help you to launch an online shop, which will surely be worthy of its shoppers time! To say more, you can forget about such things as the browser-testing process because these magnificent Christmas templates feature Cross-browser Compatibility. As a result, the site will work marvelously when it is viewed in Google Chrome, Safari, Opera, Internet Explorer, and, of course, Firefox. What is more, it will also look supreme no matter what device a buyer has in hands. That is what we call 100 % responsiveness! To summarize, we hope that these hi-res templates will bring our readers their long-awaited web stores. Moreover, these gorgeous examples are only a small part of all the products TemplateMonster provides its users with. Thus, don’t forget to visit their gallery to get more Christmas design inspiration! P.S. There is one magical thing left! As you may know, this fall TM became a real huge digital marketplace. As a result, now you can share your works with the whole world and earn good money. With the help of the company, it is possible for the experts as well as for the amateurs. Thus, don’t hesitate to know more! Helen Miller is a freelance author who is always inspired to write on web-design and web-development up-to-date subjects. Helen has a great interest in IT sphere and always has fresh ideas to share. She also cooperates with TemplateMonster.com. Follow Helen on Facebook.